a deep root system, giving the grass capability to withstand dry conditions with a quick recovery rate after damage. It is a warm season grass and goes into semi-dormancy over July and August, as the frost settles during winter. 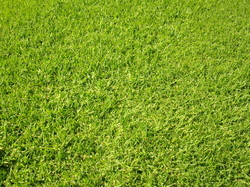 Kikuyu is commonly used in fully exposed large areas around parklands, ovals, schools and home lawns. Due to kikuyu’s hardy growth characteristics, it will need to be mowed weekly over the summer months to maintain it's pleasing appearance. 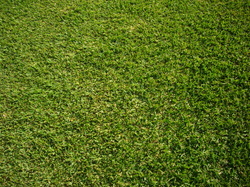 Soft buffalo is suitable for home lawn, with areas of semi-shade. It has a deep green colouring with a medium to soft textured leaf. It also has hardy stolons, but a shallow matted root system that does require regular watering to sustain growth over the summer months. Soft buffalo is a warm season grass, which is affected by heavy winter frost. The dormancy period of June, July, August is best avoided for transplanting. October through to April is an ideal time for establishment. Buffalo has a slow growth characteristic and requires less mowing over summer, which has benefits for areas around garden beds and footpaths. When choosing a lawn for the Western NSW region, we advise you to take into consideration our climatic conditions of sub-zero temperatures during winter nights, through to our extreme heat of over 40 degrees during late summer. Kikuyu, Buffalo and Couch grasses are classed as summer grasses and send stolons along the ground and self-repair quickly when damaged. The water requirements are minimal on comparison to seeded grasses such as fescue and rye, which are more suitable for colder, wetter areas in the tablelands and coastal regions. * If you are seeking a specialist turf variety, we are able to source different cultivars from a major supplier in Windsor or recommend a supplier who will be able to help to meet your needs.